Working full-time in a decent-paying job and still coming up short financially every month? Have you cut expenses where you can, lowered costs where they couldn’t be completely eliminated, and cut back on your spending – but still don’t have enough cash left over to save or invest? It’s time to look at earning more. Although the prospect of boosting your income can seem too difficult (if not impossible) to bother with, rest assured that it’s 90% mental. It only seems impossible before you make those first steps towards earning a little extra money on the side. Once you feel motivated and eager to earn more money, you’ll start seeing a variety of ways you can make it happen. The toughest part of getting started with a side hustle to earn more money is just that: getting started. You need to find a product or service you can provide to others in exchange for payment. Your side hustle should be something you’re good at, something you enjoy, and something that someone else is willing to pay you for. But how do you find something that checks all those boxes?Start by evaluating your current skill set. It’s likely that you already have some sort of specialized knowledge, skill, or ability that you can monetize and work with as a side hustle. The easiest place to look for side hustle inspiration is the work you’re already doing. Chances are, you can pull the skills required for your current full-time work and apply them to your own side hustle. Could you do freelance work on the side to earn more money? Could you offer consulting services to small businesses or startups based on your existing knowledge and informed experiences? What kind of specialized training do you have via your day job that you could use to teach others in your off-hours? You could give lessons, teach classes, or lead training seminars. Although more limiting than other side hustles, you could also use your work experience to secure a part-time job at another company. This might not be ideal, as you’ll have to maintain another schedule – but think about applying at stores and establishments that you like to make things a little more enjoyable and fun (plus, you might be able to continue saving via an employee discount). What if your line of work doesn’t make for easily-transferable skills? No worries – you don’t need to pay for any classes or special training to hit the ground running with a side hustle to make more money. There are plenty of skills that you can pick up on your own and learn as you go that can be parlayed into successful side gigs. To become truly awesome at any particular skill, you simply need to practice. Of course, we’re talking a lot of practice. Malcolm Gladwell popularized the idea of the 10,000 Rule in his book Outliers. This rule states that to become an expert in any given field, you must practice and hone your craft for 10,000 hours before you’re likely to be the best of the best at whatever it is you do. It’s just a theory – which some say is actually a myth that’s been debunked – but what is an undeniable fact is that the majority of truly successful people didn’t just appear. They worked to become successful. They practiced and they improved. You can do the exact same thing with a self-taught skill. Pick up something that interests you. Devote a lot of time and effort to practicing the skill, and improving with that time and effort. Then, once you become proficient, you’re ready to monetize. Another way of saying this is, to find a profitable side hustle look to monetize a hobby of yours. Take something you do that you enjoy, and get creative with ways to make it into your money-making side hustle. You don’t have to have the next big idea to make more money on the side. You don’t have to be the world’s leading expert in order to be worthy of selling your good or service. You simply need to be willing to teach yourself something new, and find a platform from which to monetize. Learn to code. Not all website owners know the first thing about the complicated back-end tasks associated with running a website – but they are pretty good about getting in there and then breaking something because they can’t code (or read it). Teach yourself for free at Codecademy. Improve your writing skills. Websites obviously need content – and people to create that content. If you enjoy writing, practice daily to improve. Then start applying for content gigs or blogging roles. Get artsy. The cool thing about art is that beauty is in the eye of the beholder. Everyone has their unique style, and with online stores like Etsy and Society6, it’s easier than ever for artists of every kind to connect with and sell to people from all over the world. Pick up a foreign language. It takes a lot of dedication, but you can teach yourself a foreign language. Get started with resources like Fluent in 3 Months or DuoLingo – and then start tutoring other students who want to learn a new language, too. There are so many options for those who want to learn something new – and for free, too! Consider looking into open education courses for more ideas on how to increase your knowledge and to improve your hustling skills. What self-taught skill would you enjoy monetizing? 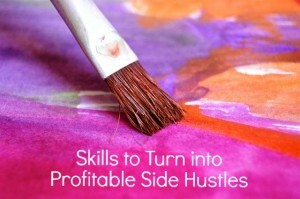 Are you currently working on building a side hustle with a skill you taught yourself? I had a friend with really great talent. He was really good at hair and make-up artistry. He served it as his side hustle and at the same time he was studying in college. And I have observed he will become successful with his passion. That is really cool! That seems like it would be a fun thing to do on the side. Anything you have a passion for can be made into side hustle money. Especially service jobs. House cleaning, mowing grass, washing windows, all can be lucrative. Agreed! Looking at service-based work is an excellent place to start. Someone is always willing to pay someone else to do an odd job for them. A passion for mowing grass? You can cut my lawn anytime!